JEREMY KENYON LOCKYER CORBELL is an American contemporary artist and investigative filmmaker based in Los Angeles California. As an investigative filmmaker, Corbell has proven to have unique and unprecedented access to military witnesses and scientists who study and engage the UFO problem. Corbell makes films on individuals from within the classified realms of the scientific and technology industry, who actively study what insiders refer to as, "The Phenomenon". With a focus on military and aerospace whistleblowers, Corbell's films are humanizing and revelatory. For this presentation, Corbell will give an audio/visual lecture, that will include film-clips from his most recent documentary and investigatory work. He will discuss his evolving understanding of The UFO Phenomenon. He will look at both the nuts and bolts elements to the UFO mystery, as well as, dive deep into the more exotic events that seem to indicate "an artificial intelligence in command of the UFO display”. Corbell will discuss the concept, similar to Anthony Burgess’s book and Stanley Kubrick’s film, of A Clockwork Orange. What Corbell calls the “mechanistic characteristics of The Phenomenon". The suggestion that, "an interactive artificial intelligence is manipulating the desire of humanity." Attendees will experience never before screened footage from a number of Corbell’s upcoming films, and explore the shadowy and mysterious hallways that compose the UFO problem. Corbell intends to "weaponize your curiosity." Independent Copenhagen based photographers, Sara Brincher Galbiati (1981), Peter Helles Eriksen (1984) and Tobias Selnaes Markussen (1982) formed an artistic collective in 2015, with the aim of following their shared inspiration in documenting issues founded on theories or first-person accounts, rather than solid fact. Using anthropologic methods when compiling their complex materials, the artists maintain a non-judgemental narrative throughout their projects. Their first solo exhibition in 2016 at Rencontres d'Arles coincided with the publication of a companion book (André Frère Editions). They were nominated for Prix de la Photo Madame Figaro and are in the collection of Musée Réattu. 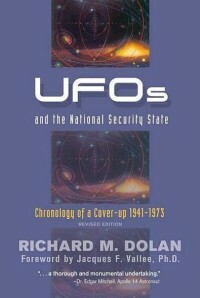 What makes the UFO Phenomena? Is it a commercially profitable story, a delusion with social consequences, a religious myth or an actual physical phenomenon? The project Phenomena examines the human need for faith through extensive research and collected data on the modern myth of ETs and UFOs. It strives to achieve an understanding of this modern aspect of humanity's eternal search for substance and enormous fear of meaninglessness. During an investigative journey through the states of Nevada, New Mexico, and Arizona, Tobias Selnaes Markussen, Sara Galbiati, and Peter Helles Eriksen have documented an alternative religion—a religion where neither God nor mankind is at the centre of the universe. In this book the three photographers present their empirically collected material. They encourage the reader to take a critical look at their research, because the complexity of the subject and constant flow of changing information mean that the pieces can be combined in infinite ways. Using an anthropological approach, the group have aimed to collect as much documentation as possible and have maintained a non-judgmental attitude when interviewing their informants. The group believes this approach maximises the chances of excavating something that eventually could lead to a new understanding.